JOHANNESBURG - Fortunes for airlines in the Indian Ocean can change quickly, as currently illustrated by the example of Air Seychelles, which I have reviewed here just one year ago. At the time the carrier operated two A330s, to Düsseldorf among other routes. That didn’t add up at all, so now the aircraft have been returned to partner Etihad while Air Seychelles restricts itself to regional traffic with A320s. 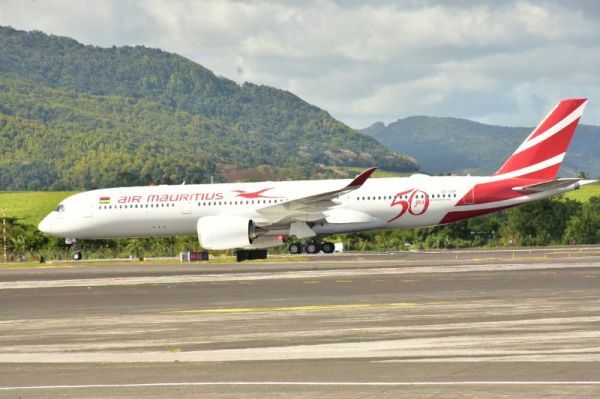 Among the few stable and –mostly- successful carriers of the region is Air Mauritius, having proudly celebrated its 50th anniversary in 2017. A major factor in the success story is the attractiveness Mauritius enjoys as a holiday destination. A total of 1.4 million sun-seekers are expected in 2018, more than the island has inhabitants. Emirates sends two A380s daily to Mauritius, showing the sheer volume we are talking about there. All the more remarkable is that the island carrier can still hold its head up and even flew profitably again lately. Its fleet however is a bit aging these days, with its five A340-300s having reached an average age of 19 years, with the oldest even being 24 years old. 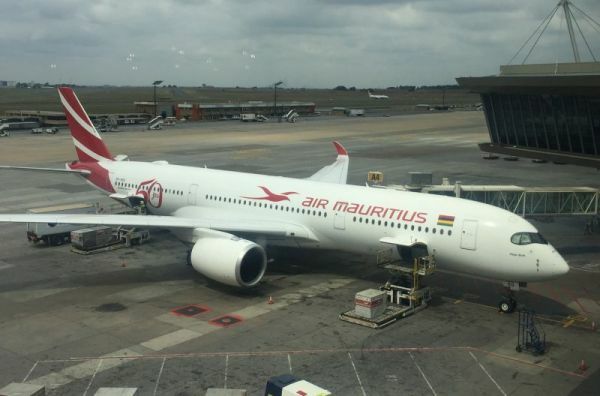 In October 2017 Air Mauritius received the first of six A350-900s ordered, of which two are flying currently on the daily routes from Mauritius to Johannesburg and to Paris-CDG, from where it is used by many transfer passengers from all over Europe. Contrary to most other holiday destinations it is remarkable that in the Mauritius traffic mix the premium market plays an important role, as most hotels on the island are positioned in the luxury segment. 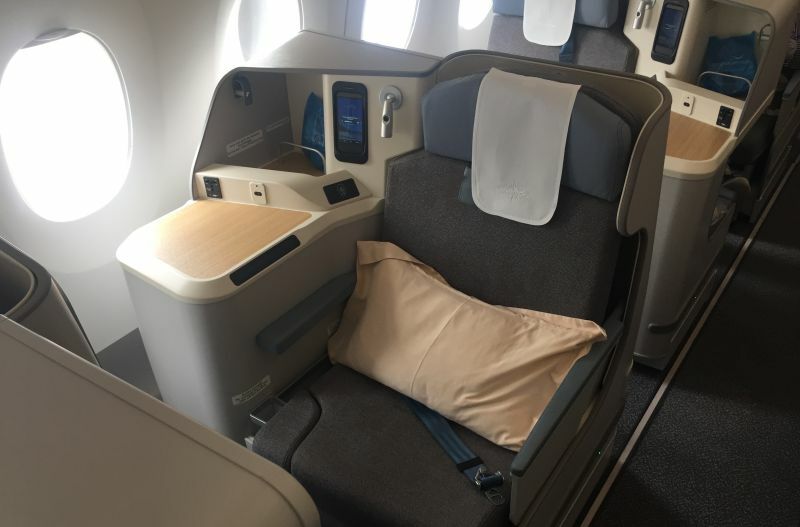 That’s why the A350s offer a full-fledged Business Class with 28 seats in 1-2-1 arrangement plus 298 Economy seats, showing clearly the premium demand in a market dominated by the upper end. The trip begins in Johannesburg in the international lounge of South African Airways, which Air Mauritius uses, being mostly big, but not very stylish. Positive is the wide variety of food offerings, also hot food, especially now at lunch time, as well as the huge panoramic windows offering ramp views and a good glimpse on the second A350 of Air Mauritius waiting at the gate. It’s been christened Pieter Both and has only been delivered at the end of November 2017, so is not even five months old. It’s not far from the lounge to boarding one floor below, as there are no clear marks for any priority boarding lane, one has to squeeze past the long Economy line. At the counter there apparently is one side meant for premium customers, where nobody stands, but there is no signage. From here boarding is swift. The whole front cabin between doors 1 and 2 is dedicated to Business Class. Its seven rows are equipped with Stelia Solstys III seats, in the centre there are adjacent seats side by side in rows 2, 4 and 6, ideal for people traveling together. 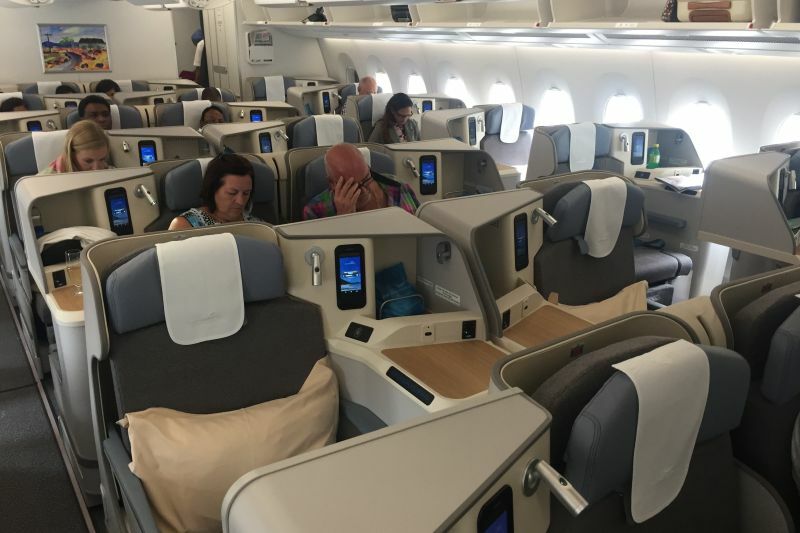 All other seats are in principal meant for single travellers with lots of privacy, ignoring the fact however that holidaymakers are almost exclusively couples up front. During the flight one can hear couples trying to communicate while seated behind each other. I am traveling alone and for me my window seat 4J on the right side is perfect. 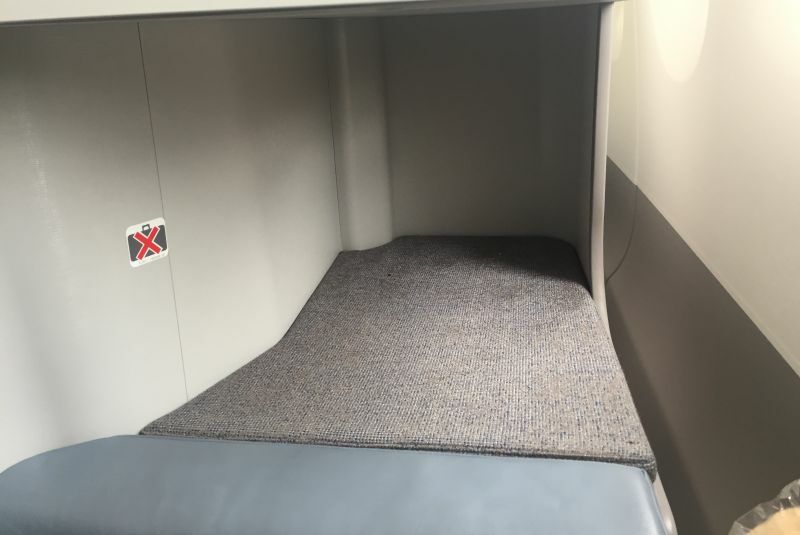 Mostly because it is one of only six seats located directly at the windows, while being shielded towards the aisle by the shell of the compartment. These window seats are also to be found in rows 2, 4 and 6. In the other rows it is the fixed table that is placed directly underneath the windows with the seat placed aisle-side. Officially seat pitch is just 44’’ (61cms), due to the staggered layout though much foot space is gained. In contrast to other current Business compartments this one offers lots of foot space sideways and upwards, offering plenty of room even for my feet size 46. Looking around in the cabin, which looks surprisingly toned-down (or shall I say dull) for a sunny holiday destination, some bright art works by local painters are vying for attention, adding at least a bit of colour. “Mauritianization” of the product is what the CEO of the airline calls this, as can be seen in other details that are supposed to be extended. Even the crew itself reflects the melting pot that symbolizes the multi-ethnic population of this island. One flight attendant for example is of Chinese origin, but hails from Mauritius. Before take-off water, juice and champagne are offered, pushback takes place three minutes before the departure time. On the big 17’’ screen one can activate a camera view, which in contrast to the A380 (with its tail and other cameras) only shows a downward view, so just concrete on the ground. 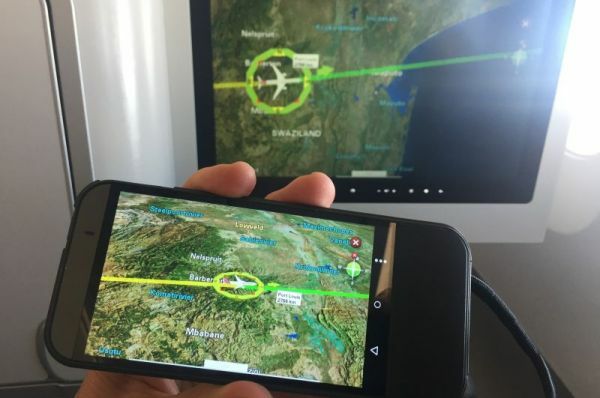 Much more appealing is the interactive flight map, enabling users to zoom in into the whole world basically by moving fingers or look at a satellite perspective, from any desired angle. Both on the big screen or on the smartphone-like handheld device, using this seat function control as a second screen. 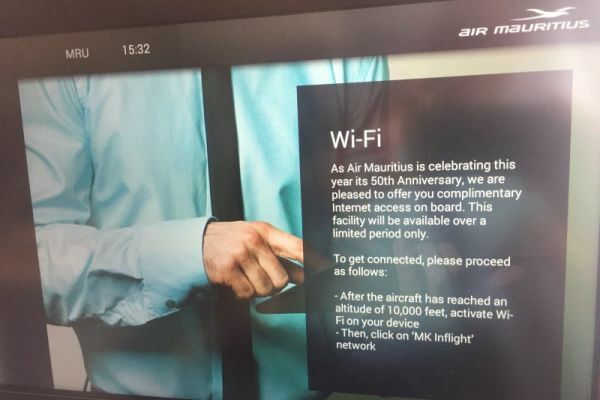 The content however is not current – under “our fleet” the user learns the status quo of June 2017 claiming that Air Mauritius will acquire two A350s while one already sits on one. The system also promises Wifi on board, initially even for free. But unfortunately nobody is able to log on. A flight attendant explains that internet access has never been working on this aircraft. The CEO however points out later this is due to a lack of satellite coverage above the Indian Ocean, he himself claims to have been online in this aircraft recently on the way to Paris. 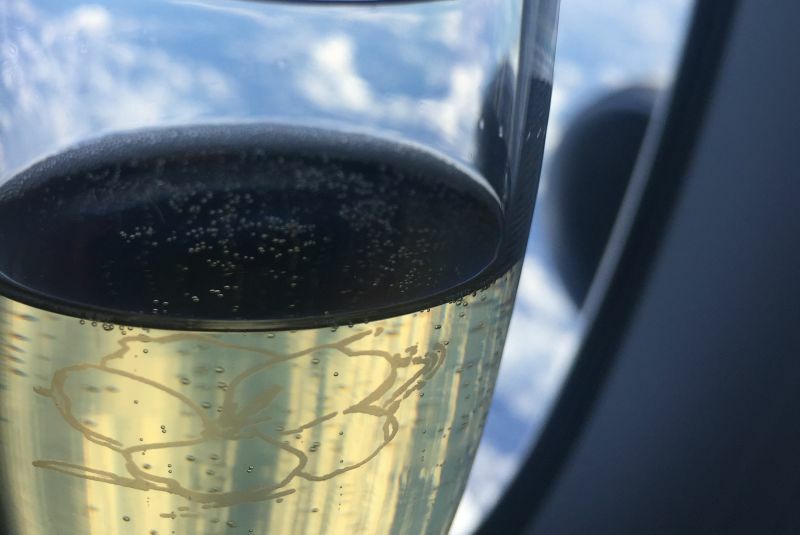 After an on-time departure, hot towels are offered, followed by (cold) cashews and drinks, I treat myself to a glass (engraved with Hibiscus flowers) of Duval-Leroy Brut champagne. Then I try “tropical punch”, offered as “made from sugar cane rum and natural ingredients”, but tasting just of sweet juice, maybe they forgot to add the rum. I am very pleased by the easy handling of the foldout table at this seat, as its mode of extension is self-explanatory, while I have recently been dragging and pushing elsewhere to make use of a table. 40 minutes after take-off the tray with the appetizer arrives, sadly not offering any choice but “smoked chicken supreme”. I don’t eat chicken and have to make do with the rest, which strangely consists of egg salad, offered bizarrely as “sparkling hardboiled egg” and a tomato-and-mozzarella skewer. Not really convincing, but in this case without alternative. Luckily the main course is more to my liking. “Cooking without borders” is the motto of the Air Mauritius catering concept. The choice is between chicken (tajine with apricots, vegetables and rice), salmon trout with vegetable and gnocchi, moussaka of broccoli and artichoke and duck confit. 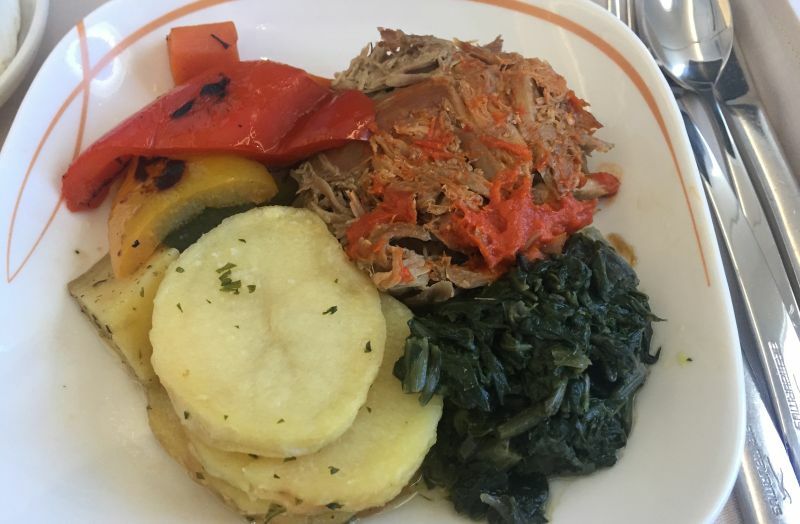 I opt for the duck, being pleased that the pulled duck meat is tasty, while not much is visible or can be tasted of the promised “peppery red capsicum sauce”. But there is a remedy, as airlines from this region always have fresh chilli sauce on board. At Air Mauritius they are even in red and green, both of which I am offered on request and make use of. 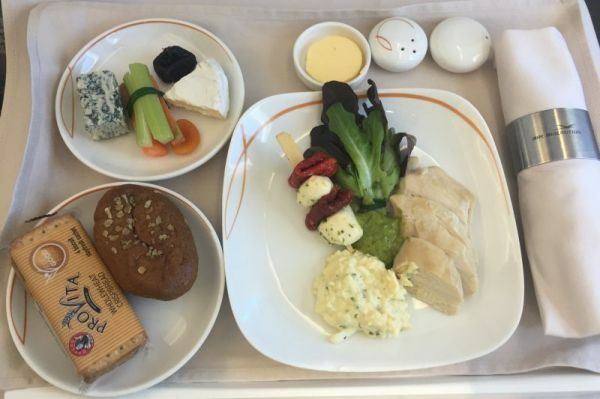 They transform my meal into the opposite of bland airline food. For drinks there are four wines on offer, all French, two reds and two whites, I try a pleasant Viré-Clessé 2016. A small cheese plate and the “sweet trio of frivolities” (that’s what the menu says, among them pineapple tarte tatin and chocolate mousse) as dessert round off the meal. But it only becomes truly Mauritian with a glass of Labourdonnais Vanilla Rum as a digestif, which makes you want to ask for more. I almost regret that this flight is so short, we have already passed Madagascar when I extend my bed for a short while. It is ca. 1.9 meters long and fairly comfortable, the outer armrest automatically slides down enhancing the bed space. I just get sleepy when the approach begins and I have to get seated upright. Thanks to the modern terminal in Mauritius ground processes move smoothly after we have landed ahead of schedule after just three hours and 21 minutes of flight. Until before the airside exit door two bulky guys are getting in my way, introducing themselves as Mauritius police and ask if I travel alone. This simple fact seems already suspicious here, also that I don’t have mountains of suitcases with me as most of the other arrivals, but after some short questions they let me go. Before the return flight I try out the Air Mauritius Amédée Maingard lounge at the airline’s home base and I’m impressed. Very spacious, not overcrowded even at rush hour, and surprisingly many children, who have their own, separated and generous play area. The bar offerings with cocktails and champagne as well as the sumptuous buffet with a wide spectrum of yummy choices are enjoyable. Economy passengers can buy their entry for the equivalent of about 40 Euros subject to availability, and it’s well worth it for a longer wait. The new A350 product of Air Mauritius is convincing and a quantum leap from the aged cabins found in the decades-old A340s of the airline. Good that Air Mauritius brings its two remaining A340s up to A350 cabin standard by the end of the year and gets two more A350s in 2019.